manually, via an Excel template, or using apps like QuickBooks and Xero. mail, and file for you. Your business is in good hands. Whether you're filing one form or thousands, filing your 1099s, W-2s and ACA forms online eliminates steps, saving you precious time. Simply fill out your form(s) directly and securely on our website and submit your order. We take care of printing and mailing the forms to your recipients, as well as e-filing your forms directly with the IRS or SSA. Skip filling out Form 1096 or W-3, because we automatically calculate the totals and transmit that information electronically, as well. Have lots of forms to file? Upload them all at once with our Excel templates, or import directly from QuickBooks and Xero to save even more time. 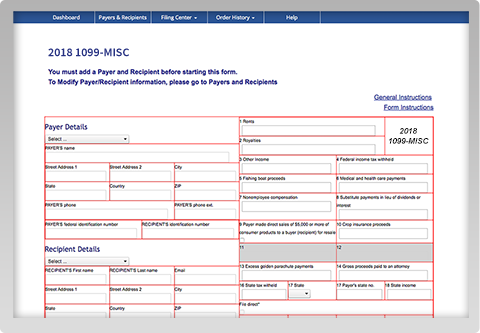 The forms you need, at your fingertips. We support the following forms: 1098, 1098-T, 1099 (MISC, B, C, DIV, INT, R, S), 1042-S, W-2, 1095-B and 1095-C.
1099 Corrections-Type 1 (MISC, DIV, INT, S and 1098) and W-2 Corrections (amount fields). Direct-to-State filing is now available for: 1099-MISC for Oregon and Rhode Island, and W-2 for Georgia, Illinois and Michigan. This is in addition to the thirty-one states that are already serviced by the Combined Federal/State Filing program for 1099s (where the IRS automatically forwards the necessary information to those states). For a full list of participating states, click here. 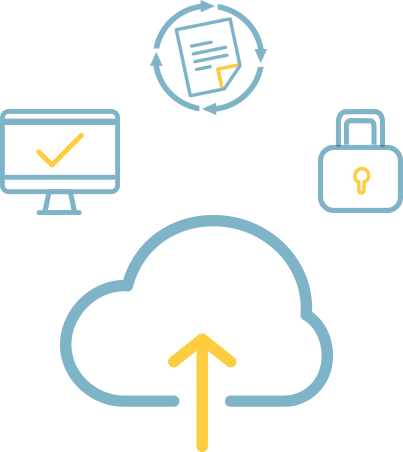 Our simple, end-to-end, cloud-based service eliminates the need for cumbersome business tax filing software you have to download or methods that require printing on forms and envelopes. No need to download and install software on your computer or network. 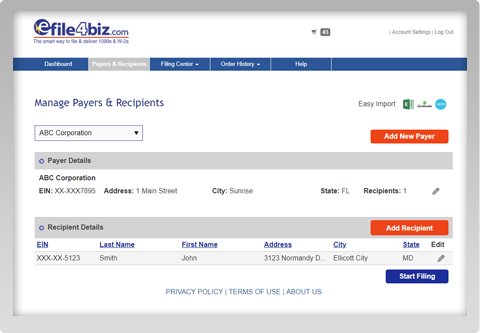 Access your records and forms on efile4Biz.com from anywhere. Updates and new features are free and automatic. You'll never have to purchase a software upgrade -just pay for the services you use. Maintain access to your filed forms and records for at least four years. No need to save and print copies for offline storage. Businesses use efile4Biz to save on the labor costs of printing, mailing and manually submitting forms to the IRS. Accountants and Tax Preparers use efile4Biz to maintain and file forms for multiple clients under one account every year. Everyone can use efile4Biz to save precious time by filing online through our secure website. "Our company is only in its 2nd year in business. As the office manager, I am doing everything I can to save money so that we can grow our business. My office skills are all self-taught. efile4Biz was inexpensive and very easy to do. I knew I had to file a 1099 and I wasn't sure how to do that. efile4Biz was great! I will definitely use it again!" "We are a small 2-person business with only one 1099-MISC vendor. For years we felt stuck buying forms from office supply companies that sell them in 20 per pack packages. We disliked having to buy more than we would ever need and spending the money for it. So HAPPY to find efile4Biz! It was quick and easy and cost efficient. Will use them from now on!!" "I switched to e-filing because I liked what you had to offer. The cost was within range, I didn’t have to order the forms or deal with filing paper forms (or mailing them) and this appealed to me. I liked that filling out the information on your website was easy and navigating it was simple. I try to do as much as I can electronically and your website fit the bill for what I was looking for." "This is not our first year filing; I have been using efile4Biz since 2012 and one of the residential attorneys filed with efile4Biz before me. E-filing saves me a ton of time, I enter the 1099S as soon as I receive them so the client is in the system and I start filing in December so I don’t wait for the last minute in case I get busy with other work-related issues. E-filing is very easy and fixing mistakes is just as easy. I e-filed 87 1099s and 3 corrections. I would definitely recommend it to friends and colleagues"
"I use efile4Biz because it is so easy. This is my second year using the service. We only need a small number of forms each year and your service saves us time and money. 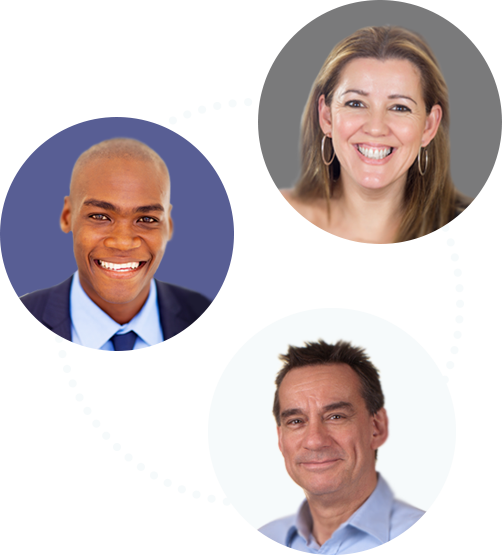 I have recommended your service to other small business and plan to continue using it in the future." Efile4Biz integrates with these popular packages so you can quickly import your vendor data, complete 1099 forms and electronically file your data to the IRS. Transferring contacts from your Xero Online Accounting Software takes just a few clicks, making it easy to complete your 1099 forms. Seamlessly import 1099 vendors right from your QuickBooks Desktop, QuickBooks Online Plus or QuickBooks Online Accountant.